Constance Gore-Booth, aka Countess Markievicz, was born on 4 February 1868 in London and was brought up at Lissadell House, County Sligo. She married Polish Count Casimir Dunin Markievicz in 1900. She entered politics in 1907 and in 1909 founded Na Fianna, an organisation for boys, who were taught military drills and the use of arms. During the Easter Rising of 1916 she was second-in-command at St Stephen’s Green. Following the surrender, she was arrested and although initially sentenced to death, this was commuted to life imprisonment. She was released in 1917 and became involved in the ongoing re-organisation of Sinn Fein. Countess Markievicz arrived in Cork by train on Saturday evening, 11 August 1917 for a Sinn Feiin rally. Large swathes of Sinn Fein members and sympathisers of the movement, foregathered in the vicinity of the railway terminus. With Countess Markievicz travelled Messrs. Herbert Mellows and Joseph Clarke, both members of the Sinn Fein Executive in Dublin. The Cork Examiner of the day highlighted that on arrival they were greeted by the heads of the Sinn Fein movement in Cork consisting amongst others Terence McSwiney and Tomas MacCurtain. The large procession led by the Pipers’ Band, proceeded along King Street, through the city, and on to the Grand Parade, where a short reception meeting was held. Other sections composing the procession represented ward contingents of the Sinn Fein in organisation, the Boy Scouts, Irish Volunteers Cumann na mBan, whilst in addition to the Brian Boru Pipers’ Band and the Irish Volunteer Pipers’ Band, the Workingmen’s and Butter Exchange Brass Bands also participated. 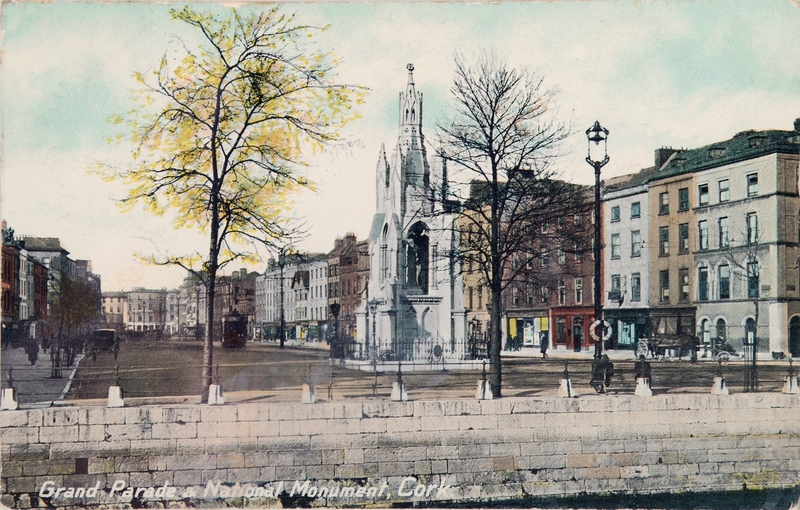 The public meeting at the National Monument, Grand Parade, was one of the largest kind in Cork for a considerable time. The proceedings connected with the reception were, from start to finish, without incident. The streets were heavily policed and about fifty extra police were drafted in from the county for the occasion. Tomas MacCurtain, who presided, said it was absolutely unnecessary for him to introduce Countess Markievicz as her name went before her. On behalf of Cork and of Munster he extended to her a very hearty welcome. He noted that such positive support was to show that the “hearts of the citizens of Cork were entirely with the definite aims for which she fought in Easter Week â€“ the putting into operation in this country, instead of the present Government, an Irish Republic”. Countess Markievicz, who was received with great enthusiasm, addressed the meeting as “Fellow-soldiers and Friends”. She opened by noting that said she was proud to see the brave welcome given her that night because it showed her that Cork City was ready to do as she was pursuing to fight for an Irish Republic. She expressed the view that the welcome given her was not personal, but was a greeting to her as representative of the men who died for Ireland in Easter 1916. She related that the proudest memory of her life was when she worked with them, plotted and planned with them, and her proudest memory of all was that she went, out and planned with them. She compared Easter 1916 to Bunker Hill, which was lost by the Americans in their War of Independence but the national pride amongst the American Continental Army prevailed; “It was that battle gave the idea of nationality to the American nation, and that battle was the first moral victory won by America, and the result was American Independence”. 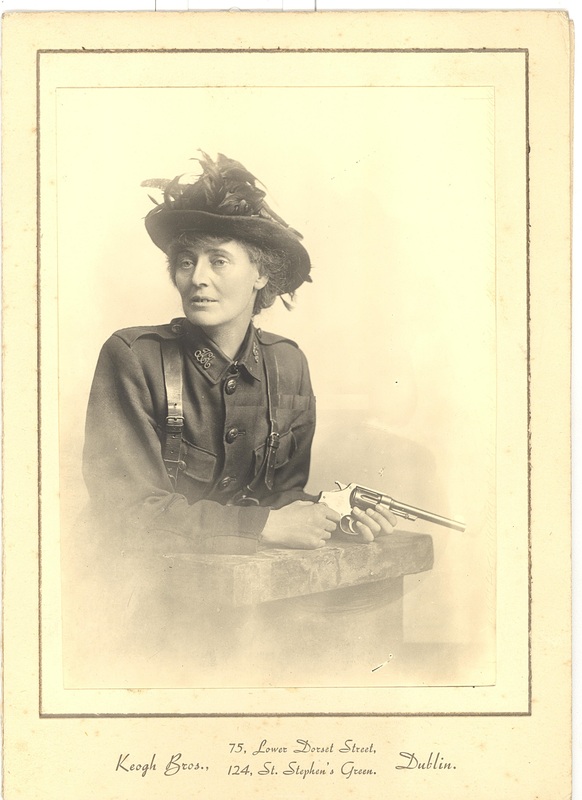 Easter 1916 to Countess Markievicz was the greatest moral victory Ireland ever achieved; she noted that it “welded together the physical forces and the moral forces of the country”. It welded the “policy of Wolfe Tone with that of Parnell”. She highlighted that they were not bloodthirsty rebel or red revolutionists; “They went out in the first battle for an Irish Republic, and to secure that ideal they must show themselves, as their countrymen had done in 1916, ready to die for it”. Countess Markievicz called on the Cork crowd to rally behind the men who died in Easter Week and that Sinn Fein were re-organising across the country. She wished that Sinn Fein would win every seat for the Westminster Parliament. She spoke about a need for a straightforward Republican policy, a policy for the foundation of an Irish Republic; “we want Irishmen to understand that, and to see that they have a representative candidate put into every position possible. We want them all co organised, to get into the several Republican societies, Sinn Fein Societies, Sinn Fein and Republicanism are the same thing”. Countess Markievicz wanted the Sinn Fein membership to follow the example of the boys of her Na Fianna organisation to drill and be organised, but also called for “physical force and moral force”; “Their thoughts at the moment of waking should be of an Irish Republic, and their resolution to work the day to help it on. That was what was wanting from every man and woman to be ready to step into the shoes of those now working for them when they had vanished, to be ready to follow in the footsteps of Connolly and Pearse”. She ended her speech with the one message: “Get ready, organise, take the country for themselves”. Kieran’s new book, Secret Cork, is now in Cork bookshops.